Piergrossi and his crew built the path at the home of Rich and Holly Mayes in Escondido, California. It replaced a narrow concrete sidewalk that led straight to the front door. The new path is wider and takes a few curves, forming generous planting pockets along the way. There’s just enough space between the stones for strips of groundcover to grow. Piergrossi used Mazus reptans, a Himalayan native. Other candidates include baby’s tears, dwarf thyme, and Irish moss. 1. Outline the edges of the path with gypsum or flour. 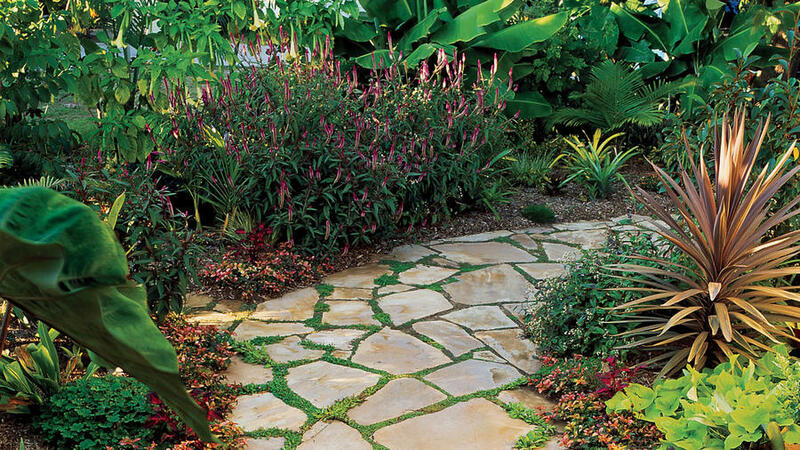 Measure the surface area of the path, then estimate the amount of decomposed granite, compost, and flagstone you’ll need to buy. 2. 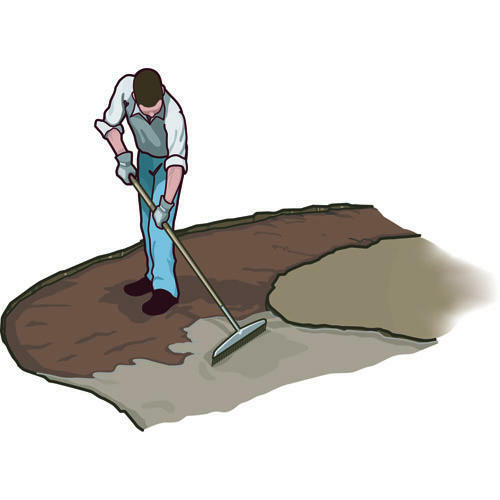 Use a spade to excavate the soil between the lines to a depth of 4 inches; rake to smooth surface. 3. Spread a 2-inch layer of decomposed granite over the area; firm down evenly with a hand tamper. 4. To ensure that the path follows your lot’s grade (essential for proper drainage), place stakes at each end, tie a string at paving-stone height between them, and attach a line level to the string. 5. Atop the decomposed granite, place pairs of flagstone slabs to act as guide stones; lay the flat side of a 2-by-4 on top of the slabs at the level of the string. Between these guide stones, arrange more flagstone pieces, using the 2-by-4 to keep an even level. Use chisel to break pieces to desired shapes (wear safety goggles), but don’t make them too uniform―you want a rustic look. Allow a gap of ½ to 1 inch between pieces for planting seams. 6. After placing all stones, estimate in linear feet the amount of groundcover you’ll need to fill the gaps. Then plant plugs from cell-packs or strips cut from mud flats; fill gaps with a mix of decomposed granite and compost. Water thoroughly.